Two soldiers have been sentenced to 10 years’ imprisonment by the General Court Martial of the 7 Division, Nigerian Army, sitting in Maiduguri, Borno State. The soldiers were accused of abducting and extorting N1m from a civilian. The Head of the court, Brig. 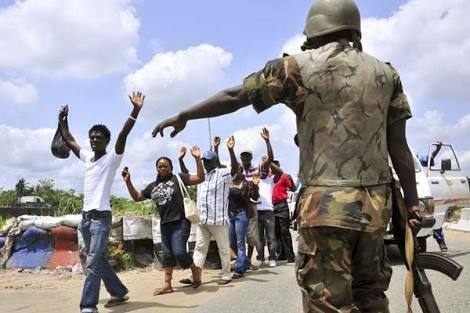 Gen. Olusegun Adesina, while delivering his judgment, said the action of the errant soldiers were unlawful and unethical. He said the duo, who stood trial for the abduction of one Alhaji Hassan on November 19, 2017, at his residence in the Ruwan Shanfi area of Maiduguri, demanded and received N1m after blackmailing their victim as a Boko Haram sponsor. The soldiers reportedly confessed that on the said date, they went to the victim’s house with a Honda vehicle and dragged him out. They allegedly said they forcefully took him to the Railway area of Maiduguri, where he was threatened and tagged a Boko Haram sponsor. The convicts said they subsequently demanded N3m from him. However, the victim was said to have begged and agreed to pay N1m to the soldiers, after which he took them to his shop at the Banban line area where he gave them the agreed sum. Adesina said after the court painstakingly considered the overwhelming facts before it, the soldiers were found guilty of the three charges against them. He said, “Having considered all pleadings by the defence counsel, on count one, you Sergeant Aliyu Hassan and Corporal Nasiru Bello, are hereby sentenced to five years in prison for abduction. “On count two, your rank from Sergeant has been reduced to Corporal (Aliyu Hassan) and also your rank from Corporal to Private (Nasiru Bello) for illegal behaviour in uniform; count three, for extortion of N1m from the victim, you are hereby sentenced to five years in prison, respectively. The service of term shall run concurrently,” he added. The judge warned that the Nigerian military would not tolerate any act that breached human rights in the country.